This meeting was a bit different in several respects, with Linda and Julie unable to attend and our guest speakers - Rob Green and Chris Collier-Woods from UTC Aerospace Systems - unable to host the meeting at their site, because of security restrictions. 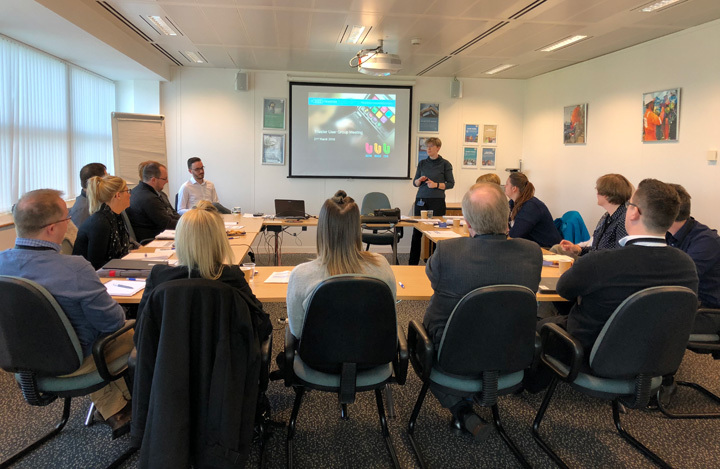 As a result, Triaster hosted the March User Group meeting at Fugro House, which made it easy to bring additional Triaster staff in for added input. 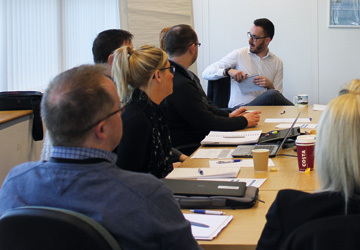 The day went well (with all attendees arriving early) and as well as plenty of ideas being shared within the group – as is usual – Alex Marchant, Triaster’s Technical Apprentice, gave his first ever features presentation, of a new Properties Editor. 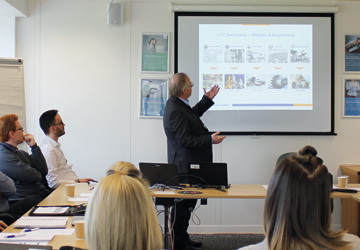 Rob and Chris gave a great presentation, essentially explaining how they have moved from their old Quality Management System, felt by the business to be owned by the Quality team, to a new Triaster Business Management System, understood by the business to be owned by the whole business. Damian Atkins, from Menzies Aviation raised the idea of adding a chat tool to their library in order to provide a chat box against each map. Damian is looking for their BMS to appeal to a younger audience, who perhaps don’t want to e-mail feedback. Damian also said that his small team wouldn’t be available to reply instantly to everyone, so would need the chat to send on the comments raised for later response. The idea of routing this through central IT was discussed, but dismissed as not feasible. It was thought that one issue with the current Process Library feedback mechanism could be that users access their BMS from a PC where they are not logged into e-mail. Using Skype to help BMS users who can’t find things via a quick screen share is useful. SnapEngage is a useful chat tool, but there are several others that are fairly easy to deploy. Adding a rating mechanism to each page was suggested, to give users the ability to feedback what they think of maps/pages. Adding a general feedback button to the Process Library homepage or Menu would be useful. The point that everyone seemed to agree on was from Steve Ward, NG Bailey, who advised that the main thing is to keep communicating and doing it via as many methods as you can - as people will always say they haven’t been told/seen something. Triaster Online/On Premise is now available for any customers who wish to consider migration. Please call Jo Dolton or Carma Evans on +44 (0) 870 402 1234 to discuss further. Michael Cousins has now taken over responsibility for Triaster Platform feature requests and works closely with Matt Burrowes in Support on any development needs. Web interface (GUI) on Properties.xml - Alex gave a demonstration of the beta version of this tool which is now available for customers to test and feedback on. Identifying new maps that have been published to a site in the publication e-mail and in the Menu Editor. 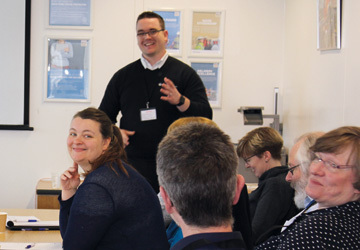 Matt talked through some things that have become clear over the past few months from customers’ systems. Including that Triaster v17.2 does require .NET v4.6 which in some cases has presented delays. Especially if SAP is in use and is an older version, as it needs updating first to continue working. Liz Carpenter talked through some of the issues she experienced during a recent Visio and Triaster upgrade. One of the key points of resolution ended up being a recreation of all HTML. Matt explained that the main reason for the issues experienced was that there were still some old VDX files that hadn’t been updated and so the publish would stall right at the end after many hours. This could only be found by checking through logs manually – it’s not something the system provides an error message for (at this time). One of the biggest delays in resolving the issues being experienced by Liz was the inability for Triaster to remotely access her company’s server – so in the end it required an onsite visit. A similar issue occurred with another company, which was tracked all the way back to a Windows update in November, that prevented Visio from working correctly. It was noted that there have been other customers who have upgraded to the new file format and not experienced any issues. Chris Needham suggested when anyone upgrades, they remove the ability for other users to open/edit maps whilst the files are being upgraded to the new format. He removed access rights when they did their upgrade last year and didn’t experience any issues.